I am always excited about eyeshadows, especially the crazy pigmented ones. Eyeshadow Crayon has become a thing and every brand has come out with their own range of colors. For years, I stuck with the Rimmel ones, but last year I discovered that Faces Ultime Pro has some drool-worthy shades too. When the range of Ultime Pro Eyeshadow Crayon launched, there were only 6 shades (1-6) and very recently they added four more colors (7-10) and I have named all the shades below. I purchased 3 of them last year and today, I am going to review the shade "Staying Alive." Back to the glamorous Hollywood days in 70’s-80’s, these beautiful eyeshadow crayons will make you feel like a movie star on the red carpet. Describing these eyeshadow collections as elegant will be an understatement, these are truly super chic! Dancing Queen 01, Night Fever 02, Last Christmas 03, Uptown Girl 04, Staying Alive 05, Shes Got D Look 06, Oh Carol 07, Mamma Mia 08, Careless Wisper 09 and Pretty Woman 10. Apply the shadow directly with the pencil tip onto the eye lid. Smudge the color quickly on the eye lids. Can also be used as a liner for most crease proof, stay on color. Packaging: The packaging of the product is simple. It comes in a chubby stick and it has to be sharpened. As much as I hate wasting product on sharpening, I know for a fact that creamy crayons can't be packaged in a retractable tube. Therefore, I cannot complain much about it. Also, every time you purchase a crayon, you get a free sharpener and thus it isn't much of a problem. The eyeshadow crayon is color coded and thus you won't have a problem and it also has a transparent cap that enables you to see the shade. Overall, the packaging is lightweight, travel-friendly and hygienic. Shade: Faces has named the shades beautifully. The shade "Staying Alive" is a dark, rich and intense eggplant shade with very fine purple shimmers. There is a certain warmth to the shade and it comes across as a shade that would suit every Indian skin tone. The color is a great alternative to black and dark brown for smoky eyes. In fact, there are days when I simply apply kajal on the waterline and apply this color on the lash line. It gives a very sultry and smoky look to the eye without being gaudy or loud. The shimmers are very fine and give a beautiful touch to the eye look. Pigmentation: The pigmentation is something you would fall in love with. I don't need a color corrector or primer to have this color show up on my eyes. 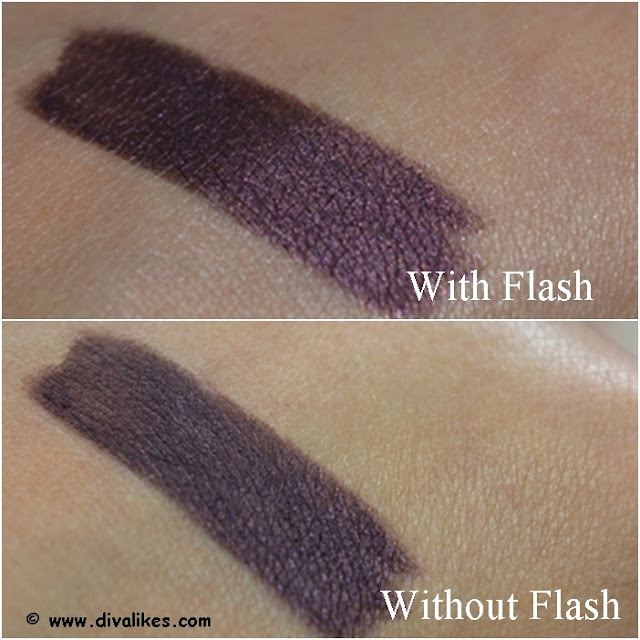 It simply translates as a dark and rich color the moment I apply on the eyes. And, if you use a concealer, it would show up like a boss! In short, deep and vibrant pigmentation. Texture and Formula: The texture of the Ultime Pro Eyeshadow Crayon is phenomenal. It is creamy but not oily or greasy at all. It glides like a dream on the eyes and goes on without any tugging or pulling of the lids. The shimmers don't feel gritty at all and the shade can be blended easily. I generally use my fingers or a dense brush. Once the shade settles down, it will not budge or smudge at all. Thus, the formula is waterproof and smudge proof. These crayons are non-sticky, dermatologically & ophthalmologically tested. Overall, the texture and formula are also wonderful. Staying Power: The crayons are long lasting. It stayed on my eyes for about 5-6 hours when used for smoky eyes and then starts fading slightly. And, as a base or eyeshadow, it stays for around 7-8 hours and doesn't crease at all on my dry eyelids. I don't have any idea how it will work on oily eyelids, though. Coming to the pricing, it is slightly expensive considering the fact that you have to sharpen the product, these crayons fall on the expensive side. However, the quality is unbeatable. Hygienic, lightweight and travel-friendly packaging. Staying Alive is a dark, rich and intense eggplant shade with very fine purple shimmers. The shade would flatter every skin tone beautifully. Creamy but non-oily, non-sticky or non-greasy texture. The formula is waterproof and smudge-proof. I would highly recommend this shade as it gives a very flattering look to the eyes. The texture, formula, and pigmentation of this gorgeous intense eggplant shade are equally good and long wearing. If you can get a discount, this would be a steal.